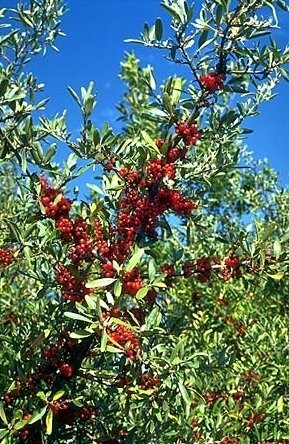 SILVER BUFFALOBERRY - a thorny, thicket forming, medium to tall shrub which may reach 12-15 feet in height. Abundant small, red, astringent fruits. Tolerant of dry and alkaline or saline soils. Not adapted to wet or poorly drained sites. Native to the Plains and Intermountain west of the U.S. and Canada. Cultivar : 'Sakakawea' Buffaloberry - a USDA, Bismarck, N.D. PMC selection which shows excellent growth and survival in field plantings.